Robert Ame received an MA and PhD from the School of Criminology, Simon Fraser University, Burnaby, BC, Canada, and BA (Cand. Mag.) in criminology and MPhil (Cand. Sociol.) in sociology from the University of Oslo, Norway. He also obtained BA (Hons) in Sociology with Psychology, from the University of Ghana, Legon-Accra. His research interests in human rights include children’s rights, female ritual servitude, and truth and reconciliation Commissions. His work in criminology focuses on the youth justice system in Ghana, sociology of law, and restorative justice. 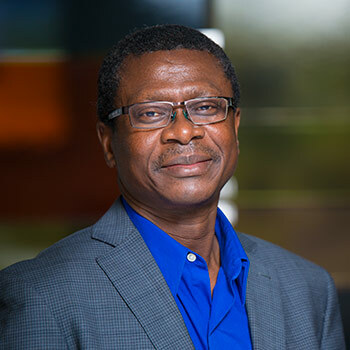 His current projects include assessment of Ghana’s juvenile justice system, a follow-up study of liberated trokosi women in Ghana and a human rights assessment of Ghana’s mental health law. He is an Honorary Research Associate at the Department of Sociology, University of New Brunswick, Fredericton, NB. Wilfrid Laurier University Merit Award (2013). Wilfrid Laurier University Merit Award (2011). Ame has for the past several years assisted students interested in doing international internships with placements in Ghana. He was part of the team that won the Association of Universities and Colleges of Canada Canadian International Development Agency-funded Students For Development project that enabled Laurier students do international internships in Ghana from 2011-2013. Contact him for more information. He is willing to supervise students in the areas of children’s rights, youth justice, female ritual servitude and African studies. Afua Twum-Danso and Robert Ame (eds.) (2012) Childhoods at the Intersection of the Local and the Global ISBN: 9780230342323 Palgrave MacMillan Publishers, UK. Robert Ame (2011) “Children’s Rights, Controversial Traditional Practices, and the Trokosi System: a critical socio-legal perspective” in Robert Ame, DeBrenna Agbenyiga, and Nana Apt (eds.) Children’s Rights in Ghana: Reality or Rhetoric? Lanham, MD: Lexington Books; pp. 129-148. Robert Ameh (2004) "Human Rights, Gender, And Traditional Practices: The Case Of Trokosi Practice In West Africa" in Anita Kalunta-Crumpton and Biko Agozino (Eds.) Pan-African Issues in Crime and Justice (pp. 23-39). Aldershot, UK: Ashgate Press. Seidu M. Alidu & Robert Ame (2012) ‘Civil Society Activism nd the Ghanaian National Reconciliation Commission: The case of the Centre for Democracy and Development (CDD)’ Transitional Justice Review, 1(1), pp. 103-135. Ken Ahorsu and Robert Ame (2011) “Mediation with a Traditional Flavour: Managing Traditional Chieftaincy and Communal Conflicts in Ghana” African Conflict and Peacebuilding Review, 1:2, 6-33. Robert Ame (2011) “The Rights of Children in Conflict with the Law in Ghana” International Journal of Children’s Rights, 19, 271-293. Robert Ame and Seidu M. Alidu (2010) “Truth and Reconciliation Commissions, Restorative Justice, Peacemaking Criminology and Development” Criminal Justice Studies: A Critical Journal of Crime, Law and Society, 23(3), 253-268. Robert Ameh (2006) “Doing Justice After Conflict: The Case for Ghana’s National Reconciliation Commission” Canadian Journal of Law and Society, 21(1), 85-109. Robert Ameh (2006) “Uncovering Truth: Ghana’s National Reconciliation Commission Excavation of Past Human Rights Abuses Contemporary Justice Review vol. 9, no. 4, 345-368. Robert Ameh (2004) “Reconciling Human Rights and Traditional Practices: The Anti-Trokosi Campaign in Ghana” Canadian Journal of Law and Society, vol. 19, no 2, 51-72. Wednesdays and Fridays, 1 to 2 p.m.